Although BMS had explored the possibility of sending missionaries to South America in 1908-10, it was not until the 1950s that the time proved right to investigate this major new area of work. The first couple sent to South America was Arthur and Kathleen Elder who had previously worked in China. In 1953 they left England to carry out ‘pioneering evangelistic work’ alongside Brazilian Baptists, settling in Ponta Grossa. The church there was already growing quickly and consequently was in urgent need of trained pastors; the Elders were soon joined in their work by further couples sent out by BMS. In the 1950s BMS work was almost solely evangelistic and church-based but in the following years agricultural and medical work was developed. 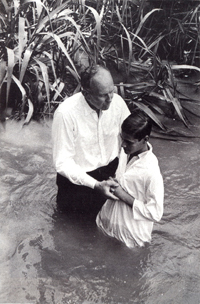 By the 1990s there were over 60 mission personnel in Brazil. In recent years this figure has decreased as the work has been handed on to the national church and mission workers have moved to partner with Baptist churches in Ecuador, Peru and Paraguay.